“Straightening” by Barbara J Carter, mixed media on canvas, 36×36″, 2011. Up until now, the biggest abstract dot painting I’d done was 2 feet square. This is MUCH bigger. The area is more than double. It was a real challenge. The background of the painting is collaged newsprint, a new medium for me. By introducing something other than paint into this painting, it magically becomes a “mixed media” piece instead of my usual “acrylic on canvas.” (There’s a little art-world lingo for ya.) I personally find “mixed media” annoyingly unspecific as a descriptor, but that’s the accepted usage. This is a continuation of my abstract dot series of paintings, which includes “Square, Red,” “Yellow Square,” and the recently completed “Multi-Colored Dots.” Besides being much bigger, this new one breaks out of the concentric-square motif for a more linear approach. I’m looking to blur boundaries, such as the distinction between geometric and organic shapes. The lines of dots are straight-ish, but not really straight. Most of the lines, but not all, are continuous. The colors form a pattern that repeats, but the pattern is not strictly adhered to. The vertical columns of newsprint text (also not perfectly straight) provide a subtle vertical counterpoint to the horizontality of the lines of dots. The title of the piece, “Straightening,” is an homage to the famous “Straightening Spears” paintings by Turkey Tolson Tjupurrula, one of the more famous Pintupi Aboriginal artists from Australia. My composition in this piece owes greatly to his work, so I thought I should honor him with the title. “Multi-Colored Dots” painting by Barbara J Carter, acrylic on canvas, 10×10 inches, framed to 11.5 x 11.5 in. For this one, I tried something new. 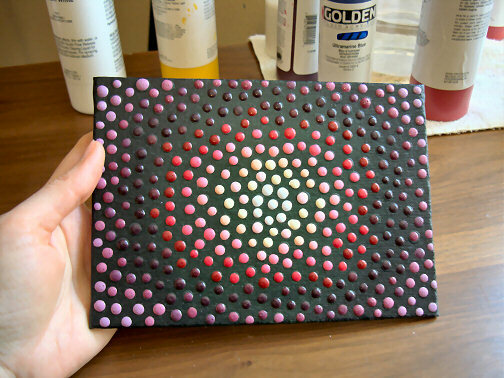 The background (the soft swirl of colors behind the dots) I made by pouring thinned paint onto the canvas. I poured several colors and allowed them to merge and blend together, with some encouragement on my part. I was inspired to try this after seeing the amazing (and huge) paintings done this way by a fellow Los Angeles artist named Suzan Woodruff. I was so intrigued I just had to give it a try. It’s messy: all that runny paint runs off the sides of the canvas and gets all over. You don’t have a lot of control over the final result, either, so it’s sort of like controlled chaos. It’s good fun! I’m definitely going to do more. Thanks for the inspiration Suzan! 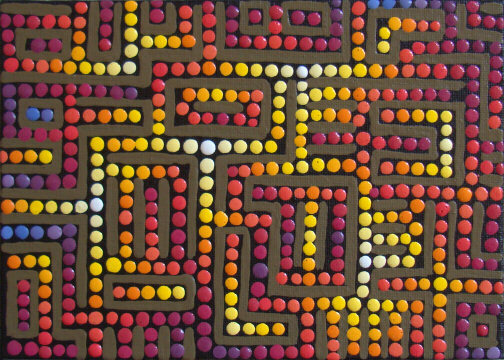 You can see my other dot paintings on my website. This was a really fun painting to make. I didn’t have any set idea about it when I started, other than it being a mandala. I just began in the center and worked my way out. I’m very pleased with the results. This points me in yet another new direction to be explored. Because apparently the neo-Pointillist landscapes, the “Sun in Trees” series, the geometric dot paintings, the big dot paintings and the little-bitty dot paintings aren’t enough projects for me right now. Ahem. A couple years ago I painted some large experimental abstract dot paintings. One in particular seemed to catch people’s fancy. I showed it to a group of artists for an informal critique and they really liked it. Actually, they kind of gushed over it. I was a little embarrassed because I didn’t really think it was that amazing. But it was nice that they liked it. And then I put it away and didn’t think much about it. It wasn’t like my “usual” work (the landscapes), so I didn’t bring it to any of my art shows or even put it on my art website. I liked it OK, but it didn’t strike me as all that amazing. Indeed, I felt some aspects of it were rather derivative. I wanted to do better. Anyway, a few months ago I had some extra space in my art show booth so I brought it along and hung it up just to fill the space. Ha ha, the joke’s on me. It was the one painting that I sold that weekend! So I painted another one like it just in time to show it at my next show, two weeks later. That one got a huge amount of attention. It was by far the most popular painting I had hanging in my booth, and not too surprisingly it sold. People came up to me as I was wrapping it up, asking if I had any more like it. I promised I would make more. I painted another one after the show, and it sold. Yikes! Now I’ve painted yet another one (shown below). It hasn’t sold… yet! I plan to paint a few more in this vein. It seems to be in demand. I might be a little slow on the uptake sometimes, but I think I finally got the message. Thank you to all the people who admired, said “wow!”, surreptitiously touched (I saw that! ), and especially the ones who bought, these paintings. You are the reason I’m doing this. You can always see all my available paintings (and some of the sold ones) on my art website, and my art show schedule is constantly being updated. I haven’t completed one of these little guys in a while. (I call ’em “little bitty” paintings, you can see more here.) It’s high time for a new one, I think. “Dots 16″ by Barbara J Carter, 5×7”, acrylic on canvasboard. The end result reminded me of a nebula (a bunch of stars or a glowing clump of interstellar gas), so I’m calling it “Nebula” as its alternate title. As per usual, it’s an experimental piece, just a way for me to work out some ideas and see what happens. The dots are nicely raised; it’s fun to run your fingertips over them. Update: It sold quickly! You can see all my other paintings, including those still available, here. It’s been pretty quiet around here lately, I know. Due to the popularity of paintings like this one, I’m focusing on painting more like it. 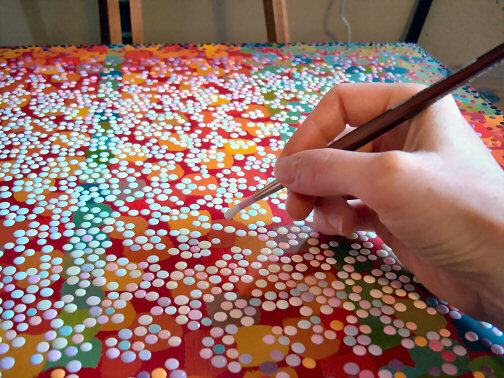 People often ask how I paint all those little perfectly-round dots on my abstract paintings. This is how: by hand, one dot at a time, using a small round brush dipped into fluid acrylic paint. The painting lies flat so the drops of paint don’t run. It’s a slow, contemplative process. 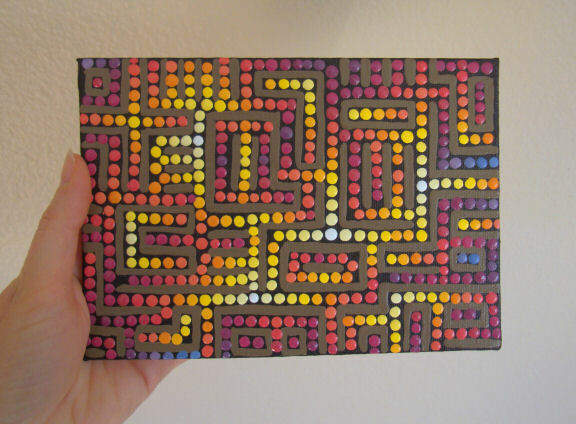 Here’s another painting in the series I like to call my “little bitty” dot paintings. They’re not exactly microscopic, but for original paintings they’re fairly small at only 5×7 inches (that’s 13×18 cm for you metric types). An intimate scale, if you like. A hand-sized work of art. I actually painted this little guy back in October, but I’m behind on posting my paintings. I blame the holiday season. Like my other little bitty dot paintings, this one is available for $30 plus a token amount for shipping and, if you’re in California, sales tax. I can ship anywhere (and often do). Happy holidays!